Petrography is a standard tool in the Earth Sciences and Helford Geoscience have over 30 years experience in the petrographic analysis and description of a very wide range of geological materials. Working with our partners we can prepare uncovered or covered thin sections, with our without resin impregnation and staining for carbonates and feldspars. 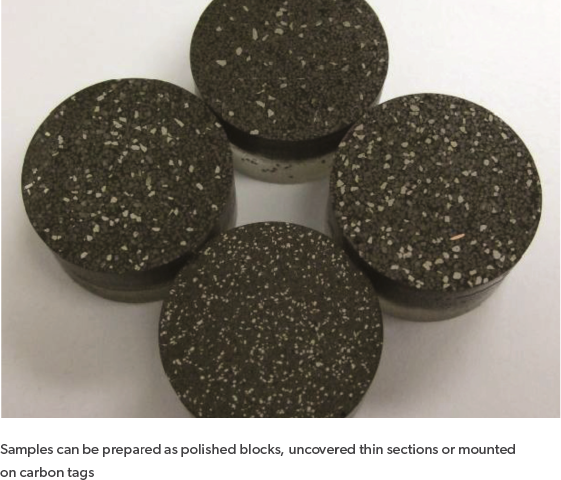 We can offer a wide range of petrographic services on sediments, rocks, aggregates, construction materials (concrete), ceramics etc including full petrographic descriptions including point counting. 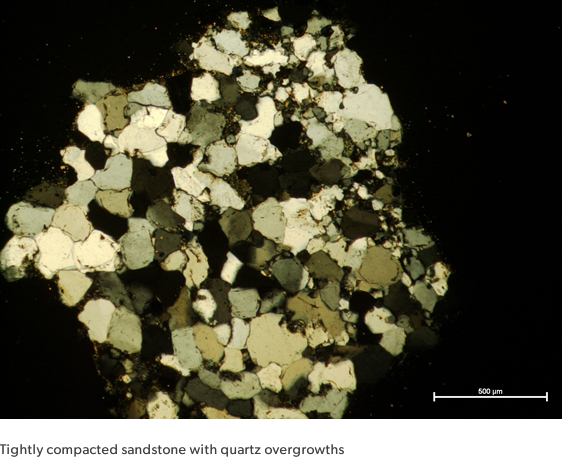 Optical microscopy can be integrated with other analytical approaches such as cathodo-luminescence, scanning electron microscopy and automated mineralogy to provide a full petrographic service. Over the last 10 years Helford Geoscience have used automated mineralogy in the analysis of ore deposits, mineral processing products, conventional and unconventional hydrocarbon reservoirs, hydrocarbon source rocks, metallurgical products and wastes, man-made particulates, man-made ceramics, and chemical products, soils, sediments, atmospheric dusts and volcanic ashes. We have the widest experience in terms of sample preparation methodologies, the design of optimal sample measurement parameters and the resultant data processing to ensure that Helford Geoscience provide the highest quality mineralogical service tailored to the specific project requirements. If the problem can be solved with transmitted light microscopy then that is what we do, but if you need to know the detailed mineral associations in a sub 10 micron mineral processing product then automated mineralogy is the way forward. Our published research on automated mineralogy includes some of the most widely cited works in the field and we continue to look at how the available technologies can be adapted to work in novel application areas. How does automated mineralogy work? Helford Geoscience use QEMSCAN technology. 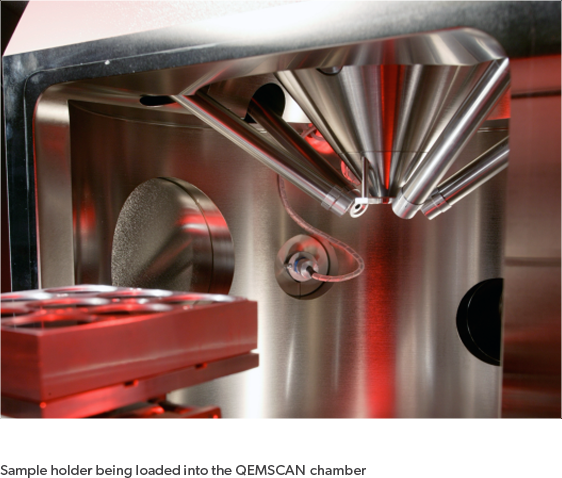 QEMSCAN is based on a scanning electron microscope (SEM) platform with an array of energy dispersive (ED) spectra. Samples are loaded into the SEM chamber and mapped at an operator defined resolution. At each analysis point an ED spectra is acquired and automatically compared with a database of known minerals, and assigned to a compositional group based on the measured chemistry. In this way samples are systematically mapped, with millions of analysis points per sample. Data outputs include modal mineralogy, grain size, mineral association, mineral liberation, porosity estimation, QEMSCAN mineral maps.